Large handcrafted greeting card with a treehouse figure. Neutral but beautiful design, suitable for any occasion. 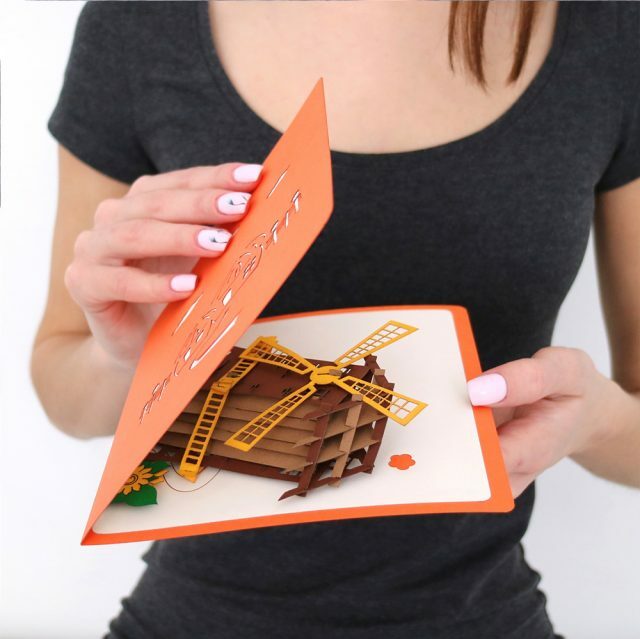 This outstanding papercraft pop-up 3D greeting card with a little treehouse can be used for any occasion or no special occasion at all. This is a kind of sure-fire choice, as its design is very neutral. You may use this card pop marvel as a birthday gift or as a holiday greeting, in all cases the receiver will be favorably impressed. Open the postal and you will see an elegant pastel white tone with a wonderful tree and a little treehouse on it, which reveals in all its beauty. The construction is made in brown and green colors. This glorious postal is a perfect choice to gift on any purposes to people of all ages. Moreover, it can serve as a unique souvenir, reminding about good spent time. 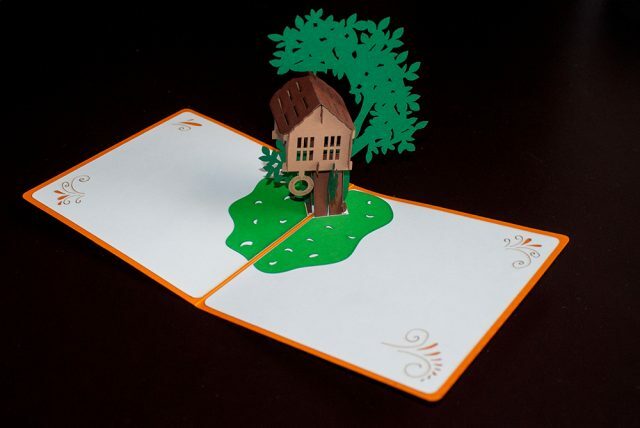 Besides, you may bring such travel pop up cards to your friend, who adores adventure and travelling. We are living in a hustle-bustle world, why not to dilute everyday routine and make your close people happy by presenting them a simple pop up card. You may acquaint oneself with a great deal of splendid postals on Say.ae and choose one you like the most. We provide a wide choice of fabulous goods, starting with special occasion pop up cards (Birthday, Christmas, New Year, anniversary, wedding) and finishing with butterfly greeting cards. Each of them can help you to greet someone and share your emotions. Thus, you may be sure that you will undoubtedly find a postal that will meet your wishes and desires. 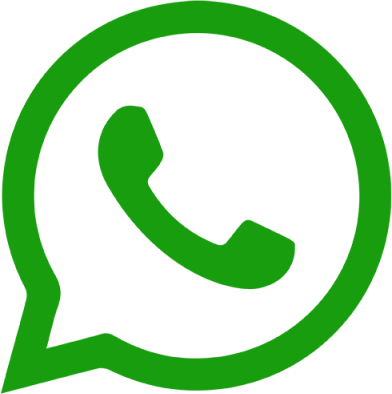 Moreover, if you need to buy online quite a number of cards, we suggest you to use our wholesale offering. In the case you are interested in – welcome to our webpage, check up the terms and information about it, and cut costs with Say.ae. Our products are of the highest quality, the materials they are made of are solely environment-friendly ones, the paper is eco-friendly as well. Our professional team monitors the manufacturing for you to have qualitatively made pop up card. Our art studio is located in Dubai, the UAE, but we are proud to provide safe and fast delivery to different parts of the world, from Abu Dhabi to Los Angeles. Independently of the distance, we guarantee a proficient conveyance of our goods in its entirety and good condition. 3D Greeting Cards and Boxes by Say Art Studio. UAE, Dubai, Jumeirah Lakes Towers.